"Parkersburg" redirects here. For other uses, see Parkersburg (disambiguation). It has been suggested that Blennerhassett Junior High School be merged into this article. (Discuss) Proposed since April 2019. 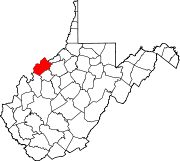 Location of Parkersburg in Wood County, West Virginia. Parkersburg is a city in and the county seat of Wood County, West Virginia, United States. 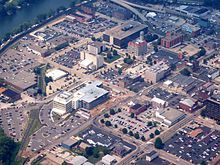 Located at the confluence of the Ohio and Little Kanawha rivers, it is the state's third-largest city and the largest city in the Parkersburg-Marietta-Vienna metropolitan area. The population was 31,492 at the 2010 census. Its peak population was 44,797 in 1960. The city is about 14 miles south of Marietta, Ohio. The Baltimore and Ohio Railroad reached Parkersburg in 1857, but lacked a crossing over the Ohio River until after the American Civil War. When the B&O completed the Parkersburg Bridge (CSX) 1868–1870 to Belpre, it was the longest railroad bridge in the world. The Bureau of the Public Debt, an agency of the U.S. Treasury Department, was relocated from the Washington, D.C. metropolitan area in the late 20th century and headquartered in Parkersburg. In October 2012, it was merged with the Financial Management Service to form the Bureau of the Fiscal Service. White settlers at first named the city Newport when they settled it in the late 18th century following the American Revolutionary War. This was part of a westward migration of settlers from parts of Virginia to the east, closer to the Atlantic Ocean. A town section was laid out on land granted to Alexander Parker for his Revolutionary War service. Virginia made grants of land to veterans for their war service. The title conflicts between Parker and the city planners of Newport were settled in 1809 in favor of his heirs. The town was renamed Parkersburg in 1810. It was chartered by the Virginia General Assembly in 1820. It was rechartered as a city in 1860. The town was the western terminus of both the Staunton-Parkersburg Turnpike and the Northwestern Turnpike. In 1857 the Baltimore and Ohio Railroad built a branch line south to the town from Wheeling, West Virginia. Travelers wanting to connect with the Ohio Marietta and Cincinnati Railroad, one of the east–west lines along the Ohio River, had to take a steamboat 14 miles north to Marietta, Ohio. Jacob Linville designed the railroad bridge planned by the B&O. It was constructed in 1868–1870 between Parkersburg and Belpre, Ohio, as part of the B&O's main line from Baltimore to St. Louis, Missouri. This drew traffic and trade from Marietta. Today the structure is known as the Parkersburg Bridge. Parkersburg served as a transportation and medical center for Union forces during the American Civil War. It developed further as a transportation hub in the gas and oil boom following that war. Blennerhassett Island State Park is an historical island located just below Parkersburg. In the late 19th century Parkersburg emerged as a major oil refining center serving nearby oilfields at Volcano and Burning Springs. The Camden Consolidated Oil Company, founded in 1866 by future U.S. Senator Johnson Newlon Camden, dominated the refining business and was sold to Rockefeller's Standard Oil Company in 1875. Camden became a Standard director and vice president and, along with John W. Davis, dominated West Virginia politics until the early 20th century. In the post-World War II period, Parkersburg became one of the leading industrial centers of the Ohio Valley, producing chemicals, glass, O. Ames tools, textiles (especially American Viscose Company rayon), plastics and polymers, iron, and steel. Parkersburg is located at 39°15'58" North, 81°32'32" West (39.266175, −81.542139). According to the United States Census Bureau, the city has a total area of 12.35 square miles (31.99 km2), of which, 11.82 square miles (30.61 km2) is land and 0.53 square miles (1.37 km2) is water. The city is situated at the confluence of the Little Kanawha and Ohio rivers. The Little Kanawha River divides the north and south sides of the city. Worthington Creek, a tributary of the Little Kanawha River, flows through the eastern part of the city. The climate in this area is characterized by hot, humid summers, cold winters and evenly distributed precipitation throughout the year. According to the Köppen Climate Classification system, Parkersburg has a humid continental climate, abbreviated Dfa on climate maps. As of the census of 2010, there were 31,492 people, 13,807 households, and 8,086 families residing in the city. The population density was 2,664.3 inhabitants per square mile (1,028.7/km2). There were 15,562 housing units at an average density of 1,316.6 per square mile (508.3/km2). The racial makeup of the city was 94.9% White, 2.0% African American, 0.3% Native American, 0.4% Asian, 0.1% Pacific Islander, 0.3% from other races, and 2.1% from two or more races. Hispanic or Latino of any race were 1.2% of the population. There were 13,807 households of which 27.0% had children under the age of 18 living with them, 39.1% were married couples living together, 14.3% had a female householder with no husband present, 5.1% had a male householder with no wife present, and 41.4% were non-families. 35.0% of all households were made up of individuals and 14.3% had someone living alone who was 65 years of age or older. The average household size was 2.24 and the average family size was 2.86. The median age in the city was 41.2 years. 21.3% of residents were under the age of 18; 8.2% were between the ages of 18 and 24; 25% were from 25 to 44; 27.5% were from 45 to 64; and 18% were 65 years of age or older. The gender makeup of the city was 47.5% male and 52.5% female. As of the census of 2000, there were 33,099 people, 14,467 households, and 8,767 families residing in the city. In 2012 the U.S. Census Bureau estimated that Parkersburg's population had decreased 0.5% to 31,261. The population density was 2,800.5 people per square mile (1,081.2/km2). There were 16,100 housing units at an average density of 1,362.2 per square mile (525.9/km2). The racial makeup of the city was 96.36% White, 1.75% African American, 0.42% Native American, 0.20% Asian, 0.05% Pacific Islander, 0.21% from other races, and 1.00% from two or more races. Hispanic or Latino of any race were 0.81% of the population. There were 14,467 households out of which 25.0% had children under the age of 18 living with them, 43.2% were married couples living together, 13.5% had a female householder with no husband present, and 39.4% were non-families. 34.0% of all households were made up of individuals and 15.1% have someone living alone who was 65 years of age or older. The average household size was 2.23 and the average family size was 2.83. In the city the population was spread out with 21.2% under the age of 18, 9.1% from 18 to 24, 27.1% from 25 to 44, 23.7% from 45 to 64, and 18.9% who were 65 years of age or older. The median age was 40 years. For every 100 females, there were 87.6 males. For every 100 females age 18 and over, there were 83.9 males. The median income for a household in the city was $21,120, and the median income for a family was $29,731. Males had a median income of $28,320 versus $18,203 for females. The per capita income for the city was $15,820. About 23.3% of families and 21.2% of the population were below the poverty line, including 35.2% of those under the age of 18 and 12.5% of those 65 and older. The Annual Mid-Ohio Valley Multi-Cultural Festival is held in June, and is an international festival featuring traditional dance and music and an international marketplace. The Parkersburg Homecoming Festival is held in August and features a parade, fireworks, half-marathon, competitions and entertainment. The Taste of Parkersburg is an event held around Memorial Day each year since 2006 which features food and drinks from local vendors. The Downtown Throwdown is BBQ and beer festival held in September. It is co-hosted by Downtown PKB and the Parkersburg Area Jaycees and was started in 2014. Several museums are located in Parkersburg, including the Blennerhassett Museum of Regional History, the Henry Cooper House, the Oil and Gas Museum, the Sumnerite African-American History Museum, the Artcraft Studio and the Veterans Museum of Mid-Ohio Valley. 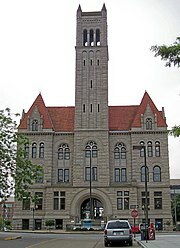 The Wood County Ravens, a semi-professional football team, was based in the city. The Ravens were a part of the now defunct Mountain State Football League. Parkersburg was home to the Ohio Valley Redcoats, a minor league baseball team, until 1998. The city was in negotiations to bring professional baseball back to Parkersburg but those negotiations fell through because of lack of support from the community. In 2008, the city and its three high schools placed second in ESPN's TitleTown USA competition. "We don't have a lot of people, nor any professional sports teams, but here is a stat for you. AAA is the highest level that a high school can compete at in W.Va. Two of the three schools mentioned hereafter are AAA schools. In Parkersburg, we have accumulated 192 overall state championships in 103 years with 183 if those coming since 1950. Parkersburg High School alone has 137 championships in its 103 years of existence. Parkersburg South High School has 38 titles in 40 years. Not to be outdone Parkersburg Catholic, a single A school, has 17 state titles of its own. Not bad considering that there are 136 high school teams in West Virginia with 38 in AAA. We may not have a pro sports team, but in high school sports, Parkersburg as a whole is pretty dominant" as written in an article on espn.com. There are several parks in the area, including Blennerhassett Island Historical State Park, Bicentennial Park, Corning Park, Point Park, Southwood Park, Quincy Park, City Park, Johnson T. Janes Park, Friendship Park, Fort Boreman Historical Park, Mountwood Park and Fries Park. Mountain State College, a private, for-profit, two-year college, is located in the city. West Virginia University at Parkersburg, a public college, is located on the outskirts of the city. Ohio Valley University is located nearby in Vienna. Meredith Manor, a private technical school for equestrians, is located slightly north of the city in Waverly. Parkersburg is the home of the Parkersburg High School Big Reds, Parkersburg South High School Patriots, and the Parkersburg Catholic High School Crusaders. The Wood County Technical Center is part of Wood County Public Schools. The Parkersburg News and Parkersburg Sentinel were the city's two major daily newspapers until 2009 when they combined to form one daily edition, The Parkersburg News and Sentinel. The same company also publishes The Marietta Times and Graffiti, West Virginia's alternative news magazine. There are many radio stations broadcasting from Parkersburg, including 106.1 Z106 (WRZZ),102.1 The River (WRVB), U.S. 107 WNUS, MIX 100 (WDMX), V96.9 (WVVV), WXIL, Froggy 99.1, 103.1 The Bear, and WPKM 96.3 FM "the Beat" which is the college radio station of West Virginia University at Parkersburg. WTAP, the local NBC affiliate, is the main local television station. WIYE-LD (CBS) and WOVA-LD (Fox / CW+) are sister stations. Parkersburg is served by Mid-Ohio Valley Regional Airport, with three flights a day Monday through Friday from Charlotte Douglas International Airport. Parkersburg is served by two major routes, Interstate 77 and US 50. Other routes through the city include WV 2, WV 14, WV 47, WV 68, WV 95, and WV 618. Into the 1960s, several major long distance train routes passed made stops in Parkersburg. This included the Baltimore and Ohio's National Limited to St. Louis to the west and Washington, D.C., Baltimore and Jersey City to the east. From 1976 to 1981 Amtrak operated the Shenandoah (Amtrak train), serving Cincinnati in to the west and Washington, D.C. to the east. Lily Irene Jackson (1848–1928), artist and daughter of John Jay Jackson, Jr. The Chancellor House in the Julia-Ann Square Historic District. The southern part of the City of Parkersburg, South Parkersburg was a separate city until it became part of Parkersburg in 1950. Suburban parts of southern Wood County include Blennerhassett, Lubeck, and Washington to the southwest, with Mineral Wells located to the southeast. The Steven Soderbergh film Bubble, released in 2006, was filmed in Parkersburg and neighboring Belpre, Ohio, using an all-local cast. Parkersburg was mentioned in the novel Night of the Hunter (1953) and the 1955 film by the same name adapted from it. In Davis Grubb's 1953 novel, Parkersburg was the town where the preacher Harry Powell was caught for car theft and sent to prison. It was worldly town that Rachel Cooper (Lillian Gish in the film) avoided because she'd been short-changed; and finally it was the home of the state troopers who came to arrest Powell for murder. Powell called Parkersburg, "One of them Sodoms on the Ohio River," referring to its reputation as a rough river town in the 19th and early 20th century. Parkersburg was the set for the 1962 television series It's a Man's World. The city was featured in a 1996 episode of Rescue 911. Other films shot in the city are Salvage and The Barbecue. ^ "US Gazetteer files 2010". United States Census Bureau. Archived from the original on January 24, 2012. Retrieved 2013-01-24. ^ West Virginia Atlas & Gazetteer. Yarmouth, Me. : DeLorme. 1997. p. 22. ISBN 0-89933-246-3. ^ "Parkersburg Weather Averages". Weatherbase. Retrieved February 3, 2014. ^ "WMO Climate Normals for Parkersburg/WSO WV 1961–1990". National Oceanic and Atmospheric Administration. Retrieved February 3, 2014. ^ United States Census Bureau. "Census of Population and Housing". Archived from the original on May 12, 2015. Retrieved August 27, 2013. ^ "Population Estimates". United States Census Bureau. Archived from the original on May 22, 2015. Retrieved June 19, 2015. ^ "Mid-Ohio Valley Multi-Cultural Festival". Mid-Ohio Valley Multi-Cultural Festivalmerce. Retrieved June 7, 2014. ^ "annual mid-ohio valley multi-cultural festival". West Virginia Department of Commerce. Retrieved June 7, 2014. ^ "parkersburg homecoming festival". West Virginia Department of Commerce. Retrieved June 7, 2014. ^ "Parkersburg Homecoming Festiva". Parkersburg Homecoming Festival. Retrieved June 7, 2014. ^ "Taste of Parkersburg - Downtown PKB". Downtown PKB. Archived from the original on February 9, 2016. Retrieved May 12, 2016. ^ "Downtown Throwdown BBQ & Brewfest". Downtown PKB. Archived from the original on February 9, 2016. Retrieved May 12, 2016. ^ "The Blennerhassett Museum of Regional History". The Blennerhassett Museum of Regional History. Retrieved June 7, 2014. ^ "Oil and Gas Museum". Oil and Gas Museumy. Archived from the original on October 7, 2011. Retrieved June 7, 2014. ^ "The Parkersburg Nostalgic Gazette". Blennerhassett Island Historical State Park. Retrieved June 7, 2014. ^ "Blennerhassett Island Historical State Park". Blennerhassett Island Historical State Park. Retrieved June 7, 2014. ^ "Walt Barnes". Pro-Football-Reference.com. Retrieved June 7, 2014. ^ a b c d e f g h i j k "Parkersburg, West Virginia". City-Data.com. Retrieved June 7, 2014. ^ Dawson, Jim and Propes, Steve Propes (2003). 45 Rpm: The History, Heroes and Villains of a Pop Music Revolution. Hal Leonard Corporation. p. 170. Retrieved 7 June 2014. ^ Onofrio, Jan (1999). West Virginia Biographical Dictionary. North American Book Dist LLC. p. 72. Retrieved 6 June 2014. ^ "WV town helps sister city in tornado recovery". June 1, 2008. Philip W. Sturm. Wood County Reflections: A Pictorial History. Published 2005, Donning Company Publishers, Virginia Beach, VA.
Bernard L. Allen. Parkersburg: A Bicentennial History. Parkersburg Bicentennial Committee. Printed 1985 by Josten Publishing Co., State College, PA.
Wikimedia Commons has media related to Parkersburg, West Virginia. Wikivoyage has a travel guide for Parkersburg. Chisholm, Hugh, ed. (1911). "Parkersburg" . Encyclopædia Britannica (11th ed.). Cambridge University Press. This page was last edited on 16 April 2019, at 17:09 (UTC).